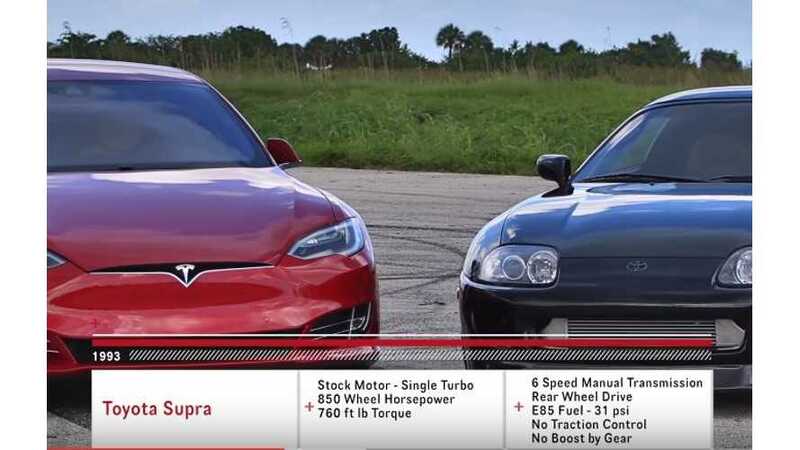 The Tesla Model S P100D typically dominates the drag race scene, especially the 1/8- and 1/4-mile, but it's not often we see the P100D pitted against a car with approximately 1,000 HP. 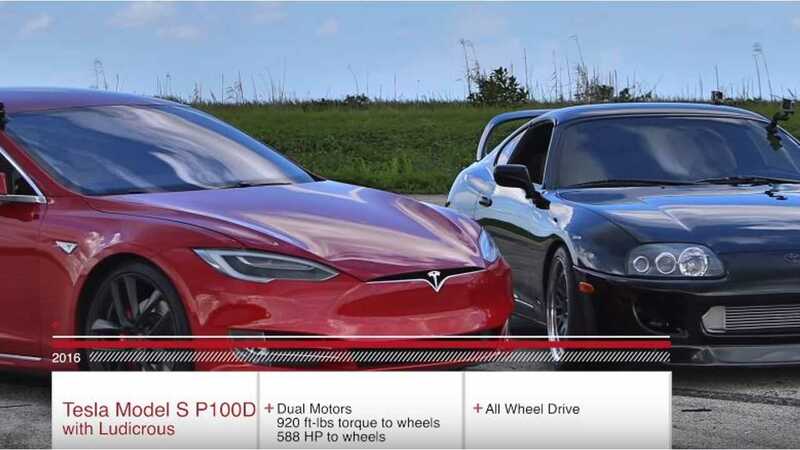 That's the case here as the Model S P100D lines it up against a modded Toyota Supra with a claimed 1,000 HP. DragTimes tries to even the event out by performing two races (technically 3), one from a standstill and the other from a rolling start at 50 mph. Here's a spec rundown for both vehicles (note: actual HP figures for modded Supra are unknown). In the video you'll see that the Supra doesn't stand a chance from a standstill start. It's no contest as the AWD Tesla blows it aways. From a 50 mph roll though, the Supra fares far better. It quickly catches the Tesla, which gets the initial jump and then accelerates out into the distance in no time. "Watch one of the most advanced and quickest cars on the road, the Tesla Model S P100D Ludicrous take on an old school import from Japan with 1,000 HP, a single turbo Toyota Supra." *InsideEVs does not endorse nor support the act of street racing. It's highly illegal and extremely dangerous. Racing should be performed only on a track.